Running your own business gives you the freedom to be your own boss because you have the privilege to choose your work hours and business practices. It can be one of the most exciting shifts you'll ever decide on your life, transitioning to becoming a full-time entrepreneur. On the other hand, starting a business and making it a success requires hard work, focus and commitment but most importantly, your passion must drive you to start one. Elite Nails Spa is born out of passion. Our humble beginnings are backed up by our willingness to serve and make each client happy with their nails salon experience with us, our determination to improve our everyday spa practices and challenging our own selves to surpass our customer’s expectations. It's not an easy path to almost perfect each goal to succeed but we thrive to make it happen. As we celebrate our third year mark in the nails spa industry this coming August, we wanted to grow even more and share our passion. It is our vision to make our partners satisfied and fulfilled with our promised opportunities for their investment. Our current franchisees are passionately dedicated to providing an outstanding spa experience at an affordable price. We value every client and see every opportunity as a chance to show great hospitality and build a loyal following of customers and raving fans. More to that, this is how we do business. Do you want to be part of our family? Today is a great time to consider a future with Elite Nails Spa! Discover amazing opportunities in spa franchising. 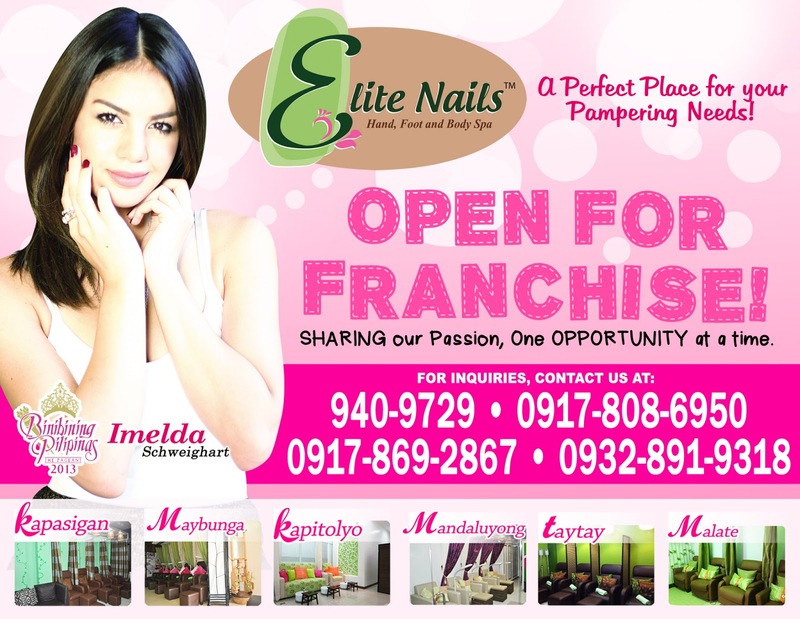 You may call these numbers for inquiry (632) 9409729, (63) 9178086950, (63)9178692867 and/or email us at elitenailsspa.manila@gmail.com. You may also contact us through our facebook page, instagram & twitter. To learn more about Elite Nails Spa, click here.